Obviously, things haven’t gone well for the St. Louis Cardinals in the past week. Yet returning to Busch Stadium after a 1-5 road trip and taking on the Chicago Cubs seemed to be just what they needed. The Cardinals made winning look easy last night, quickly ending Ryan Dempster’s 33-inning scoreless streak right away and topping the Cubs 4-1. Not all the problems of the past week are solved — they had opportunities to score more than that and left nine on base — but we’ll concentrate on the good. Which was definitely the offense in the first. For whatever reason, most of the time I listen to Chicago sports radio in my car, specifically The Score. It’s the White Sox flagship station, but of course they talk plenty about the Cubs too. And that meant yesterday there was plenty of talk about the Ryan Dempster trade rumors — things were heating up with the Dodgers, then they weren’t, then other teams were making a push too, would he even make his start last night? Brian Hanley and Mike Mulligan advocated he not do so — Dempster’s trade value was at its peak with the 33-inning scoreless streak, there’s always a risk of injury and they had other options for starting. And suffering a season-ending injury would just be so typical Cubs. Dempster obviously did start, but did not suffer any injury — other than the ending of that scoreless inning streak, that is. The Cardinals quickly took care of that after lead-off man Skip Schumaker (yes) was called out on strikes. 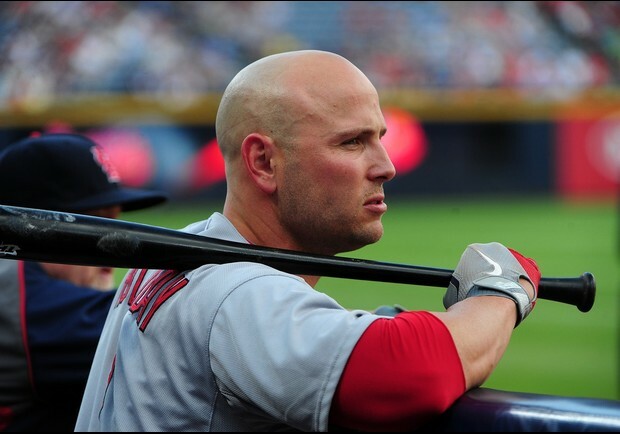 Allen Craig, Matt Holliday, Carlos Beltran and Yadier Molina all singled, with Craig and Holliday scoring. Lance Berkman grounded out but scored Beltran. And after all the offensive trouble the Cardinals have had, just like that they scored three runs. In one inning. Meaning hits with runners in scoring position for the Cardinals. Hooray! Then, in the third inning, Matt Holliday did this — which, after traveling 469 feet, is the longest home run ever at new Busch Stadium. (It even earned a “goodness gracious” from Dan McLaughlin in that call, which makes me all the more glad I chose the WGN broadcast last night.) That put the Cardinals up 4-1, as the Cubs scored one in the second on a Darwin Barney sacrifice fly to score Bryan LaHair. 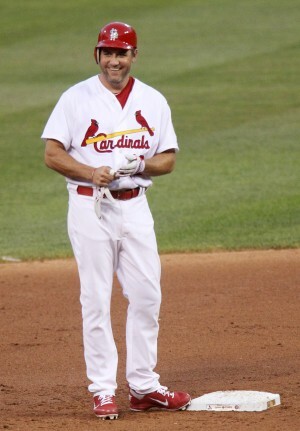 Also in the third, Lance Berkman was all smiles after finally — finally — getting his first hit since May. While there’s no video of the hit online, at least a picture of said smile was available on the St. Louis Post-Dispatch website. And, as the home of the LB Fan Club, I am therefore obligated to run the picture — right? Because who doesn’t want to see a happy LB? Pitching-wise for the Cardinals, Kyle Lohse again did what K-Lo always does. He went seven innings, allowed only the one run on six hits, struck out four and walked just one. He lowered his ERA to 2.71 (it was 2.80 going into the game), which is now sixth-best in the National League, and won his 10th game. And, as has been the case all season, he pretty much did so anonymously. We need to start the K-Lo Fan Club. Who’s up for joining? Following K-Lo were Mitchell Boggs and Marc Rzepczynski in the eighth, then Jason Motte in the ninth. Motte only needed two pitches to get the first two outs in the top of the ninth, but then Luis Valbuena couldn’t play along — he had to strike out to end the game. Still, a six-pitch outing for Motte’s 21st save is pretty efficient. And so was the game overall by the Cardinals. Here’s hoping the easier times continue — and the timely hitting does as well. For the Cubs perspective on the series, check out A League of Her Own. The Cards and Cubs are back in action tonight at 6:15 p.m., with Jake Westbrook facing Matt Garza. The game is on Fox Sports Midwest and WGN, meaning I have an alternative to Dan and Al yet again … thankfully.